This is the first installment of a series probing the issue of joint vs. separate money in marital and cohabiting relationships, inspired by the great discussion in the comments of my slippery slope of separate money post. In each post in this series, I review the methodology and major findings of a paper in the field and then discuss how my husband and I fit into the results. I encourage you to share your reactions to the paper in the comments! Burgoyne CB, Reibstein J, Edmunds A, Dolman V. 2007. “Money Management Systems in Early Marriage: Factors Influencing Change and Stability.” Journal of Economic Psychology 28: 214-228. Whole wage – One person (usually the wife) manages the finances, except for the personal spending money of the other spouse. Partial pooling – A significant portion of income is managed by the individuals, with an agreed-upon portion contributed by each for joint expenses. Independent management – Individuals maintain control over their income and have separate financial responsibilities. The number of couples participating in each system of money management at each timepoint is shown below. There is a strong trend toward increased merging of finances with the passage of the first year of marriage. (The paper presents more nuanced data concerning how each couple behaved – for instance, of the 17 independent management couples at time 1, at time 2 6 remained independently managing, 7 had moved to partial pooling, and 4 had moved to pooling.) Some of the factors influencing that shift were the acquisition of a home and mortgage and the (anticipated) arrival of children. 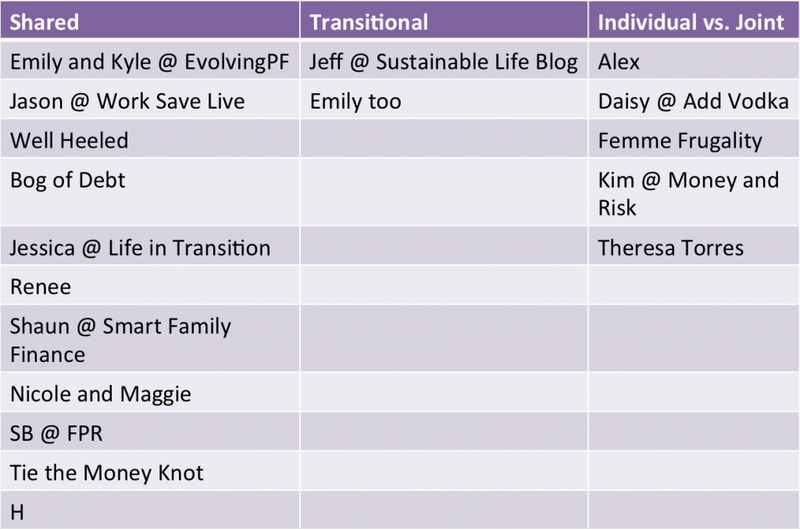 While we just have a snapshot study, I thought I would try to categorize the commenters from the slippery slope post into the various management systems that they identified that they practice or would like to practice. 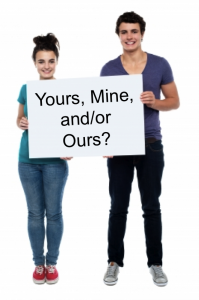 Shared Ownership – “A strong view that marriage implied collected resources” (p. 223). “Couples with this view of money tend to say that it is ‘all in one pot’ even when the money is held in separately named accounts” (p. 224). Individual vs. Joint Ownership – “A clear line between personal and collective finances” (p. 223). “These couples generally had a more explicit sense of account keeping in all senses of the word… They expressed a strong with to retain some control over their own money and tended to emphasize their individuality within the relationship” (p. 224). Transitional Ownership – Couples in this group made statement supporting both of the other views and seemed to waffle between them. As you would expect, after one year of marriage there was a shift toward the shared ownership view. There was also a strong overlap between ownership view and money management style at time 2. For instance, 14 of the 18 couples with a shared ownership view practiced pooling and another 3 practiced partial pooling, and 14 of the 18 couples with an individual vs. joint view practice partial pooling and another 3 practiced independent management. For those “individual vs. joint” couples who practiced partial pooling, it was a pragmatic solution to dealing with household expenses. For “shared” couples who practiced pooling, they desired to treat their money collectively based on their beliefs concerning sharing. If you reread the post I wrote on joint and separate money, you can easily see how entrenched I am in the shared ownership mindset. Both the totally joint model that Kyle and I follow and what I was calling the allowance model are examples of pooling money management styles, and even what I labeled the roommate model is partial pooling. I can’t even conceive of a marriage that practices independent money management! Some of the people in the study were like me – “Some thought that keeping money separately and either splitting bills or paying for separate expenses was ‘an odd way to do things’” (p. 224). From this study I have learned that it all stems from these different ownership models, and plenty of people do have the individual vs. joint mindset. Again, here is how I categorized the commenters from the slippery slope post according to the ownership model they expressed. The authors reported some additional results and observations that I found interesting. As I mentioned, the money management categories developed by Pahl in 1989 did not include the partial pooling category and did include an allowance category. The allowance system was when the breadwinner managed the money generally but provided a set amount to the spouse for management of the household. None of the couples in this study followed the allowance model. Perhaps the tweaking of this model indicates a significant shift between 1989 and the mid-2000s in the popular money management styles of married couples? Shared model couples “tended to say that their treatment of money reflected openness and transparency in the relationship and showed trust” (p. 224). Individual vs. joint model couples “also said that their system indicated trust, but in this case it was trust that their partner would pay towards the expenses without having to be monitored” (p. 225). One observation that really rang true for me was that for shared model couples “there is typically no money in the household that they feel able to spend without consultation, except, in some cases, a small amount of personal spending money that has typically been agreed to as ‘own’ money” (p. 224). I can’t think of an instance where I have or would make a purchase without at least informing Kyle of the possibility that it would happen, and in most cases the exact or estimated amount of the purchase. Especially now that we’re sharing a car, there are no unexpected/uninformed trips to stores! And I don’t mind it at all, which I’m sure is part of the reason why we haven’t implemented any individual discretionary spending. In the conclusion, the authors issue a small warning for couples practicing independent management or partial pooling. “Maintaining the visibility of earned income and the right to decide when it could be used for collective purposes seemed to be important to maintain a separate sense of financial identity within the marriage. However, there was a down-side to maintaining such visibility: not contributing financially also becomes more visible and this had implications for the few women who could see this looming ahead… They anticipated future difficulties, and some women, especially those with more separate financial arrangements, had already started taking steps to avoid dependency or having to ask for personal spending money when they started a family… Our participants exemplify the moral dilemmas… in attempting to achieve a balance between commitment and self-reliance in today’s more fluid and ‘voluntary’ relationships… There are inescapable tensions in trying to balance the competing desires for financial autonomy vs. equality when there is a disparity in partners’ incomes. A couple’s choice of financial system may ameliorate this tension, but it is unlikely to resolve it completely. Indeed, the present findings suggest that attempts to preserve separate ownership and financial identity in the early stages of marriage may risk sowing the seeds of inequality at a later stage” (p. 226). I love reading interview-based studies because the authors can occasionally quote or paraphrase the subjects! I would have tweaked this paper or done follow-up research in just a few areas to make it more relevant to my questions regarding this topic. At the initial interview, I would have asked the couples how they expected their management system to change by the one-year mark. If Kyle and I had been in this study, we would have gone from independent management at time 1 to pooling at time 2, while our ownership model would have been shared all along. If asked at time 1, we would have said we planned to implement pooling. Similarly, I think that the authors should have differentiated a bit more at time 1 and time 2 between couples who did and did not cohabit. If this were a quantitative study instead of qualitative, a larger sample size that could tease out the influences of children and property ownership on money management system would be interesting. The authors didn’t report how the couples felt about their money management system or measure marital satisfaction at all. I would particularly be interested in knowing that for the couples with mis-matched ownership models and management systems. Also, it seems that every couple (interviewed individually) agreed on their management system and ownership model. I find that a little hard to believe, especially for ownership model. I would like to see how couples with different ownership models (at least going into marriage) implement management systems. I wonder if there would be any transitional ownership model couples left 5 years into marriage. Of course, as an American, I prefer to read studies done in the US! Are the results more or less what you expected? What ownership model and management system fits you? What additional questions would you have liked the authors to address? 31 Responses to "Joint and Separate Money Series: Changes During the First Year of Marriage"
I have the same questions about long-term planning regarding independent management couples. From my observation of the comments and people of whom I have inquired, a typical situation is that one spouse is in more debt than the other at the beginning of the marriage and he/she wants to pay it off without burdening the other spouse. So I guess in that case there isn’t more debt being accrued. I think the trust issue the paper mentioned is directly applicable – you have to trust your spouse is being responsible and sticking to whatever you agreed on for the separate finances. Can anyone practicing IM shed some light on long-term planning? Studies are interesting, but I think it`s best to stick to whatever works for you as a couple, not necessarily how the study tells you to do it. I couldn`t imagine having to tell the boy about every purchase I make – whether I pay for parking or lunch, that would put a huge strain on our relationship. I don’t think this study was telling anyone what to do. It was just cataloging how money management systems and attitudes change over the first year of marriage. This is really interesting! I don’t know why, but you could write about couples and money and I would read it with rapt interest every single day! This is a very interesting study. I always like to hear about couples and money. As you listed in your post, we pool everything together and it works for us. Interesting study Emily. Thanks for going through the research and presenting it, it was very thorough. I can’t say I’m shocked by any of the results. Being married myself, pooling is the best way to go as it forces you to communicate and get on the same page together, not only in finances but in other areas of your marriage. The only thing I would like to see is how are these couples are doing with finances. Does one managements system lead to having more debt than the other? Does one lead to more investing? I think that would be interesting to see. Jon White recently posted..JW’s Financial Coaching Podcast-Do you view money as cake or as candles? Very good thought, Jon. I think evaluating the success of both the marital and financial outcomes would be quite instructive. I guess I fall somewhere in between whole wage and pooling. I’ve got $400/month of my paycheck plus income from side hustles (between $200-$250/mo usually) to pay my debts, savings, and personal spending. The rest goes in a joint savings account. My wife then uses her income and my income in the savings account to pay all the bills, plus her personal savings spending. We jointly manage finances insofar as she regularly has me look at the budget and asks my opinion when she’s trying to make a decision. But at the end of the day, she’s the one paying the bills and moving money between accounts. This is the system that seems to work for us, having settled out of a few arguments over money during our first 2 years of marriage. Does your wife get personal spending money as well and is it comparable to yours? Does she have side hustles? She personal spending comes straight from the joint account. As such, I don’t have any clue on exact numbers, but she doesn’t tend to be a big spender. I would put it a bit more than mine, but well under mine if you including my debt payments. Right now, she’s trying to get started in selling PartyLite, but that’s about it for side hustles. At this point, she doesn’t seem to have much of a desire for it. Hey Emily! These studies are fascinating. I do have a clarification though – our finances are separate right now because we are not married. Once we are married, we won’t be merging accounts right away because the logistics of doing so in a long-distance relationship are just too much to tackle for now. We do think of our incomes as shared resources, though, and we see our debts and tuition as shared obligations. So I’d think our philosophy is the “whole pot” but logistically we are separate. Even now we don’t really keep track of who pays for what. I thought I categorized your situation appropriately…? It’s unusual that (after you’re married) you’ll still be practicing IM and thinking of it as joint money, but I agree it’s more functional for your situation and from the study 1 of the 18 couples participating had a joint mindset but didn’t practice pooling or partial pooling. I’m surprised at the amount of couples who have individual accounts still after one year of marriage. Jeff and I were poolers immediately after getting married and still share everything wholly and equally. One thing I think about is that I take my vows very seriously and Jeff does, too. I wonder if that’s why we had no problem merging our finances? Michelle recently posted..Should We Buy A Dog? I’m not sure if it’s a matter of taking marriage seriously for couples who keep separate finances but rather a different conception of marriage. We had no qualms about merging our finances after marriage either (though it took some time logistically), but that is because we subscribe to an idea of marriage as complete one-ness in all areas. It makes sense to me that people moved toward more shared systems in the first year of marriage, but I’d be interested to see longer term changes. I suspect a lot of people take a while to move towards totally joint finances just because, well, there are many steps to it and it can be complicated. Also curious about the “what about marital satisfaction” question – we know what people did, but what did it mean to them? Haha yes. And oh the things I can tell you about trying to get money in the social sciences. Interesting article. When I commented on your slippery slope article, I practiced independent management since I wasn’t married yet. After being married for three days, we’re trying to have a whole wage mentality (kind of hard after managing my finances independently), but we haven’t actually merged our accounts yet. That’s next on our to do list. Are you or is your husband going to manage the finances? Any thoughts yet on what the allowance for the other spouse will be? I love studies like this. I’m not surprised by the changes between point 1 and point 2, that seems like couples settling into a routine. I, too, would have enjoyed some of the feelings behind the numbers. Perhaps they weren’t presented because the researchers felt it would impede on the empirical data? I wonder…. I think the interviews were fairly qualitative; there was no indication that they asked the couples to rank satisfaction or anything else. And I have yet to see a study with any measure of financial success. I’ll keep looking! I think part of the issue is just the logistics of implementing the pooled solution so soon after getting married. There must be a fair amount of inertia that just keeps the status quo going. I do think that full pooling or some type of minimal allowance (if needed) is the way to go if for no other reason than just keeping track of everything easier. Great post Emily. CultOfMoney recently posted..How to retire on a pension?